For the racehorse, see Georgia Pacific (Standardbred racehorse). Georgia-Pacific lumber mill in Eureka, California (May 1972). Georgia-Pacific was founded by Owen Robertson Cheatham in 1927 in Augusta, Georgia, as the Georgia Hardwood Lumber Co. Over the years it expanded, adding sawmills and plywood plants. The company acquired its first West Coast facility in 1947 and changed its name to Georgia-Pacific Plywood & Lumber Company in 1948. In 1956, the company changed its name to Georgia-Pacific Corporation. In 1957 the company entered the pulp and paper business by building a kraft pulp and linerboard mill at Toledo, Oregon. The company continued to make a series of acquisitions, including US Plywood in 1987, Great Northern Nekoosa in 1990, and the Fort James Corporation in 2000. The Fort James Corporation was the result of a series of mergers of enterprises that included the Fort Howard Corporation, the James River Corporation and Crown-Zellerbach. In August 2001, Georgia-Pacific completed the sale of four un-coated paper mills and their associated businesses and assets to Canadian papermaker Domtar for US$1.65 billion. It was announced on November 13, 2005 that Georgia-Pacific would be acquired by Koch Industries. On December 23, 2005, Koch Industries finalized the $21 billion acquisition of Georgia-Pacific. Georgia-Pacific was removed from the NYSE (it had traded under the symbol GP) and shareholders surrendered their shares for about $48 per share. 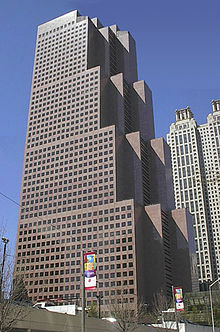 The Georgia-Pacific Tower in Atlanta continues to house the company's headquarters. The Crown Zellerbach Building was built as the headquarters of Crown Zellerbach in San Francisco in 1959. On January 11, 2010, Georgia-Pacific signed an agreement to acquire Grant Forest Products' oriented strand board ("OSB") facility at Englehart, Ontario and the associated facility at Earlton, Ontario, as well as its OSB facilities at Clarendon and Allendale, South Carolina, for approximately $400 million. The transaction closed in July 2013, following Canadian regulatory review and US court approval under the Hart-Scott-Rodino merger review process. On June 19, 2014, Georgia-Pacific announced it will acquire SPG Holdings. Georgia-Pacific operates under many different brand names. Angel Soft, Quilted Northern, and Soft n' Gentle are toilet paper and facial tissue brands. Blue Ribbon, Clutter Cutter, DensArmor Plus, DensDeck, DensGlass, DensShield, DryPly, FireGuard, GP Lam, Hushboard, Nautilus, Ply-Bead, Plytanium, Southern Gold, Sta-Strait, Thermostat, ToughRock, Wood I Beam, and XJ 85 are building and remodeling brands. Brawny, Dixie, Insulair, Mardi Gras, PerfecTouch, Sparkle, Ultra, and Vanity Fair are tableware, paper towel and napkin brands. Advantage, Image Plus, and Spectrum are office paper brands. Georgia-Pacific, Broadway facility, in Green Bay, Wisconsin, was formerly owned and operated by Fort Howard. Stephen Engelberg of The New York Times wrote that in 1995, Georgia-Pacific persuaded the U.S. Senate Judiciary Committee to approve an amendment that derailed a pending E.P.A. investigation of Weyerhauser Company, Louisiana-Pacific Corporation, and Georgia-Pacific, arguing that the E.P.A. was "unfairly applying present-day standards to decisions made 10 to 15 years ago", and that the E.P.A. test method overstated the emissions from wood products factories. Georgia-Pacific's opponents believed "the measure could allow Georgia-Pacific avoid installing pollution gear at many of its plants." Engelberg wrote, "Nonetheless, [Georgia-Pacific] said they would install controls at plants that need them." Georgia-Pacific is also involved in several remediation sites, many of which were landfills used by other manufacturers, municipalities and other businesses, and individuals. Two of the primary remediation sites - the Fox River in Wisconsin and Kalamazoo River in Michigan - involve the cleanup of PCBs. Georgia Pacific is contributing to dam removal work as part of an effort to clean up PCB contamination in Kalamazoo. Each year the U.S. Environmental Protection Agency (EPA) requires Georgia-Pacific, as it does all large manufacturers, to report publicly quantities of certain chemicals that facilities release into the air, water, and onto land. For the 2006 period (as of Spring 2008) – the company showed a 12 percent decrease in these releases from 2005. Between 2000 and 2006, Georgia-Pacific reduced its total releases and transfers of these specified compounds by 26 percent. Georgia-Pacific publicly reports on its environmental performance through its Environmental and Social Responsibility report, which is available on its web site. In 2007, the EPA announced legal agreements among itself, Michigan, Georgia-Pacific, and Millennium Holdings (a corporate successor of the Allied Paper Corporation) requiring the companies to clean up an estimated $21,000,000 worth of environmental damage to the Plainwell Impoundment Area. Another settlement required an additional $15,000,000 of environmental work on the Kalamazoo River Superfund Site. Georgia-Pacific is the largest user of de-ink fiber in the world, and its subsidiary company GP Harmon trades in the recycled material. The company has expanded into other markets in countries like Mexico and China. In 2005, president of the division Simon Davies estimated that China would require the import of scrap paper from the US and elsewhere for at least 15 years. In the long run, he asserted, the growth of the Chinese middle class would be correlated with a large increase in paper production, and having viable paper recovery systems in place would be of great value to them. The Georgia-Pacific Paper Mill in Crossett, Arkansas was the subject of environmental documentary film Company Town (film), released in 2016. The film alleges that improper waste disposal by the mill has caused a cluster of cancer incidents in the area around the mill. In, 2008, 93% of Georgia-Pacific's freight was hauled by SmartWay Transport Partners, an increase of 47% over the previous year. Of the 145 carriers Georgia-Pacific uses, 104 were SmartWay carriers, an increase of 33% over 2007. In 2008, Georgia-Pacific experienced tremendous growth in its intermodal shipping. Georgia-Pacific was able to work with its customers to increase lead-time and create more intermodal freight shipments without significantly impacting customer's needs, thus increasing intermodal loads by 39% in 2008 as compared to 2007. Georgia-Pacific uses advanced software to pack loads more efficiently and increase cube utilization in its trailers. The company also reduced empty loads by 10%, increased utilization of local fleets, and established an idling reduction policy in place at its 12 distribution centers. In the summer of 2008, Georgia Pacific held a fuel conservation summit to explore ways for shippers and carriers to work together to further reduce fuel consumption from its freight transport operations. The Georgia-Pacific Foundation Scholarship Program for Employees' Children has awarded nearly $10.5 million in college scholarships to children of the company's employees between 1988 and 2013. Speaking to the Demopolis Times, vice president Kelvin Hill said of the program, "A well-educated workforce is crucial to the long-term success of our mill. When we support education, we’re helping create the workers that our business and the state of Alabama will need." Through its Georgia-Pacific Bucket Brigade program, the company awards volunteer fire departments around the United States more than $100,000 annually, and as of 2013, has awarded over $1 million since the program began in 2006. ^ "Crown-Zellerbach". Notable Names Database. Soylent Communications. 2009. Archived from the original on 2014-07-03. Retrieved 2010-02-04. ^ Georgia-Pacific. "Georgia-Pacific Completes Asset Acquisition Of Temple-Inland Building Products". MarketWatch. Retrieved 26 July 2013. ^ "Georgia-Pacific to buy SPG Holdings, adding to Green Bay holdings". Milwaukee Business Journal. June 20, 2014. Retrieved July 14, 2014. ^ "Sustainable Practices - Georgia-Pacific". Georgia-Pacific. Retrieved 21 March 2018. ^ "Environmental Protection Agency". epa.gov. Retrieved 21 March 2018. ^ Taylor, Brian. "Paper Recycling Supplement--World View". Recycling Today. Archived from the original on 22 February 2014. Retrieved 25 July 2013. ^ "SmartWay Transport Partnership". U.S. Environmental Protection Agency. Retrieved 23 April 2011. ^ Staff reports. "Girl with local ties wins 2013 Georgia-Pacific Scholarship". Demopolis Times. Retrieved 25 July 2013. ^ Baltzer, Paul. "Koch Companies Support Volunteer Firefighters, Emergency Responders across the U.S." BusinessWire. The Wall Street Journal. Retrieved 25 July 2013. Wikimedia Commons has media related to Georgia-Pacific.